At the core of every camping trip … of nearly every great outdoor experience, for that matter … is a campfire. 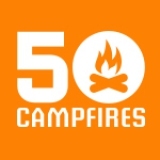 That’s how 50 Campfires got its name – 50 states, 50 Campfires. So if you want to be the “campground super hero” among your family and friends, you need to know how to gather, build, light, and maintain a stellar campfire. How good are your skills? Let’s find out! For all your campfire-starting and cooking needs check out the complete camping gear section at BassPro.com. Are You a Campfire Super Hero or Campfire Unqualified? You’ve got to know the basics – flame, fuel, safety, and more – to be a true campfire pro. Answer these 12-quiz questions and find out where you stack up!